Honor 8C is the next smartphone from the Huawei sub-brand. The smartphone, which is expected to launch in India next week will be the first one to feature the latest Qualcomm Snapdragon 632 chipset. According to a new report by IANS, the Honor 8C will be an Amazon Exclusive smartphone in the sub-continent and it could be priced around Rs 15,000. Earlier, it was reported that Honor is looking to launch the 8C in two variants- 4GB+64GB and 6GB+64GB. Going by this rumour, if Honor really launches the phone at Rs 15,000, it might attract fewer buyers as Xiaomi just launched the Redmi Note 6 Pro smartphone with exceptional cameras at a starting price of Rs 13,999 in the country. To recall, the Honor 8C was launched in China last month and it’s still the only handset with the Snapdragon 632 SoC. The phone arrived in three variants in China- 4GB+32GB, 4GB+64GB and 6GB+64GB, but in India, we might see the launch of only two variants. The base variant with 4GB of RAM and 32GB of internal storage is priced at Yuan 1099 in China which translates to Rs 11,900. If Honor brings the handset around the same price to India, it will give a stiff fight to the Xiaomi Redmi 6 Pro and Realme 2 smartphones. Coming to the spec-sheet, the Honor 8C may not impress many even despite sporting the new Snapdragon 632 SoC. The phone has a 6.26-inch HD+ display which carries a resolution of 720×1520 pixels and 19:9 aspect ratio. As mentioned, it comes powered by the Snapdragon 632 SoC, paired with 4GB, 6GB of RAM and up to 64GB of internal storage. There’s a microSD card slot for storage expansion and thankfully it’s a dedicated slot. This device from Honor ships with EMUI 8.2 which is built on top of Android 8.1 Oreo. Honor may roll out the Android 9 Pie update to the smartphone in early 2019. As for the cameras, we get a 13MP primary sensor with a f/1.8 aperture along with a 2MP monochrome sensor with f/2.4 aperture. Up front, there’s an 8MP shooter which features f/2.0 aperture. The phone is armed with a 4000mAh battery and lacks fast charging support. 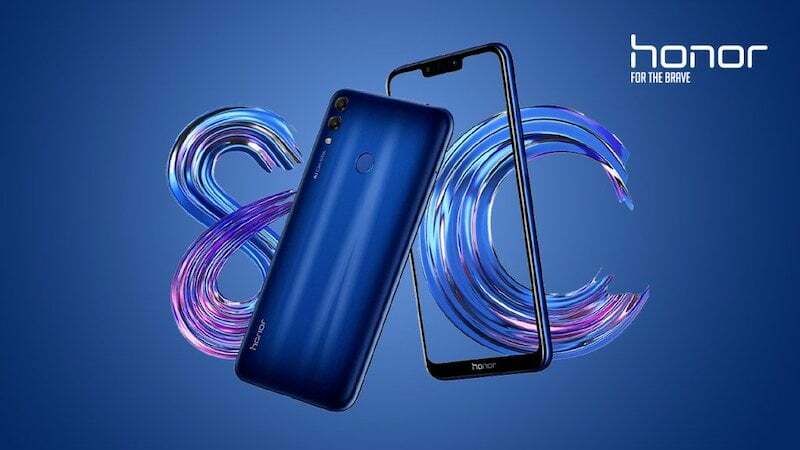 The design of the Honor 8C is pretty much identical to the Honor 8X smartphone that was launched in India very recently at a starting price of Rs 14,999. The Honor 8C’s fingerprint scanner is placed on the rear side, and much like other Honor smartphones, it will come with software-based Face Unlock feature. It will be interesting to see the pricing of the Honor 8C as the competition in the industry right now is very high. We have the Realme 2 Pro with Snapdragon 660 SoC starting at Rs 13,990, Xiaomi Redmi Note 6 Pro at Rs 13,999 and other handsets such as Motorola One Power and Nokia 6.1 Plus around the same Rs 15,000 price point.